ATTENTION ALL CWLC Pre-K families! 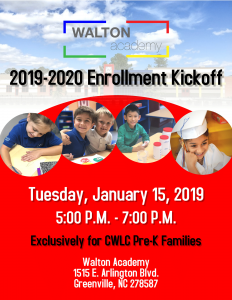 Mark your calendars for this Tuesday, January 15th @ 5:00pm- 7:00pm for Walton Academy’s 2019-2020 Kindergarten Enrollment Kickoff! This event is exclusively for CWLC Pre-K families! Come meet faculty and staff, speak with teachers, and learn more about Walton Academy’s excellent academic program.